Picture this, a breeze gently blowing through the shutters while you nestle by the fire with a cup of hot cocoa, better yet, a pumpkin spice latte in hand. That, my friends, is your perfect fall day. Yes, we are those people that start trimming the tree come November so it’s only suitable that in this household we start dressing out the house with fall decor pronto. Plus, given it’s only a month until the official start date of this season, I thought now is a better time than ever. There’s just one minor fall ‘faux pas’, it’s not traditional to deck out your pad for this season in this country. Why? Simply because there’s no Thanksgiving, that, paired with the fact that Autumn just symbolizes the ushering in of a long winter. Given that I’ve never let that stop me before, here’s some tips to dress up your space and welcome this fresh + chilly time of year. 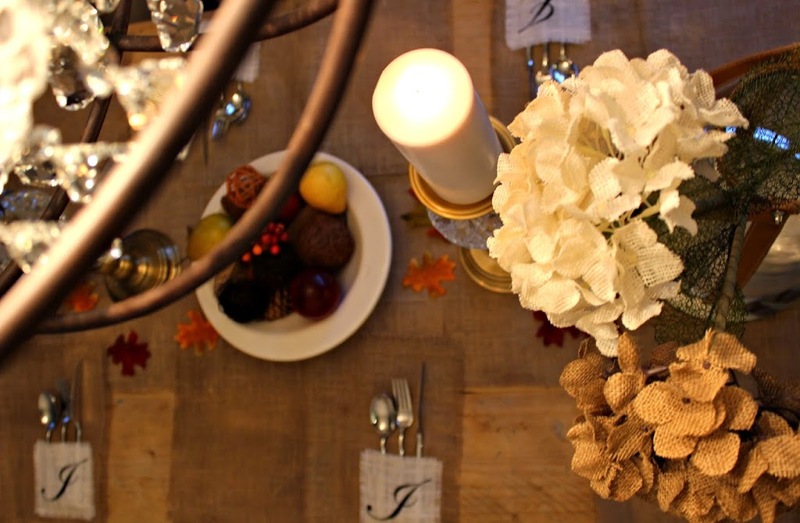 Fall decor in a few easy + affordable tips. 1. Select a color palette that suits your room. The color scheme in our living room is crisp white with robin egg blue and silver accents. There are also a few wooden pieces thrown in to warm the space up a bit. Throwing in a lot of oranges, auburns and golds just wouldn’t have suited the space, so I’ve chosen to stick with the whites + neutrals. Decide what color scheme would work for you and play around with finding decor to complement your space. 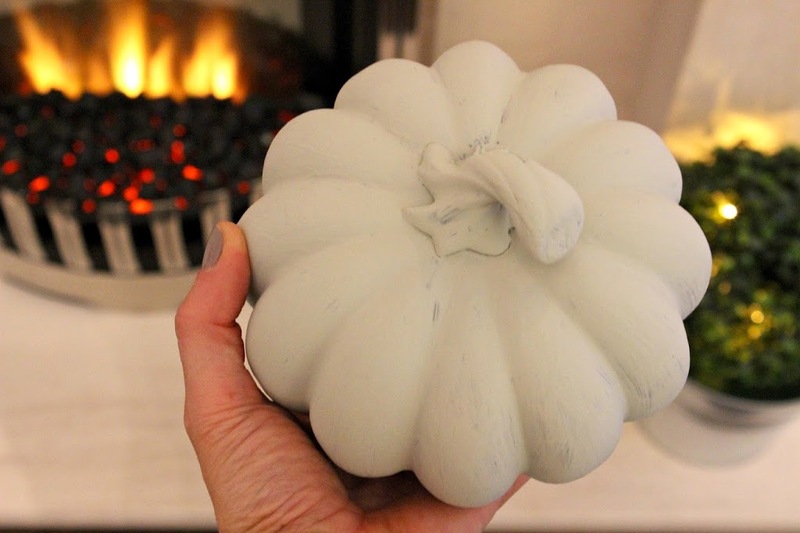 After a few coats of gray paint this pumpkin which was once a bright orange now perfectly suits the room. 2. Consider what you already have. The pumpkin above, for instance, took little effort and yet added an extra touch to the mantel. 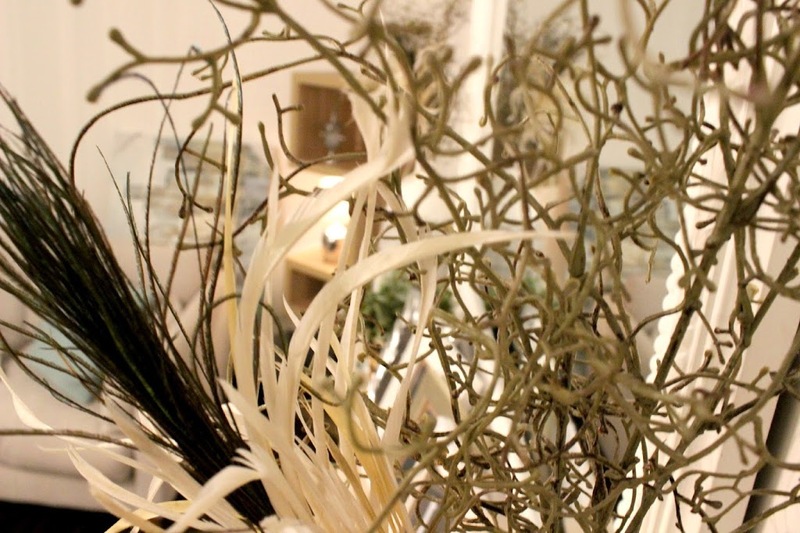 These feathers + branches were left over in the garage from a previous arrangement and, because I had already decided a theme, I knew they would work for this season. Take a look around to see what you already own + how you can switch it around to fit the seasonal decor. 3. You can never have too many candles. For the wintry months candles are always a ‘yes’. The ambiance the light of a candle gives off instantly warms the room, and the scent also adds a dimension to your decor. I’ve chosen spiced pumpkin + cinnamon stick flavors, the aroma makes you want to snuggle up and cuddle those that you love + share stories of years gone by. Okay, maybe that’s a little dramatic but I bet it painted a pretty picture in your head? 4. 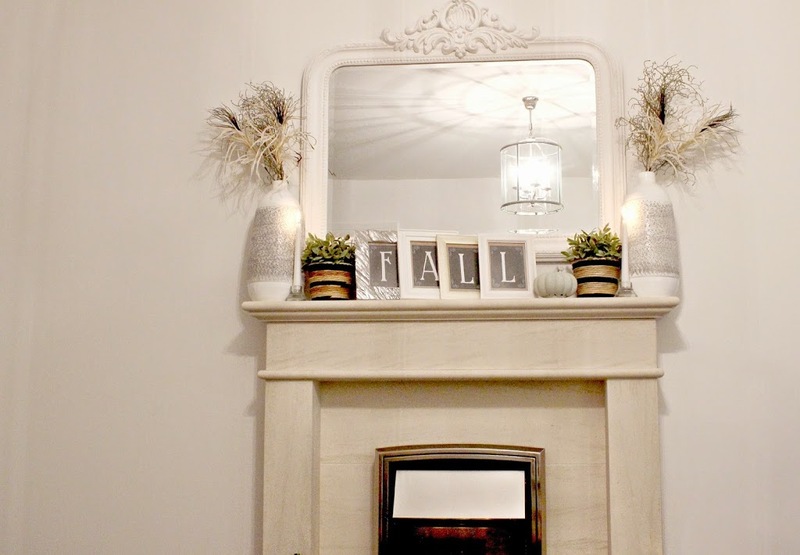 Printables are another easy way to transition your summer decor to the autumn season. I’ve chosen this set of letters for the mantle and this chalkboard print for the dining area. It instantly sets the tone and it’s an easy way to tie in the decor. 5. Bring the outdoors inside. Fruit styled in a decorative bowl can easily add to the table decor, either fresh or artificial. 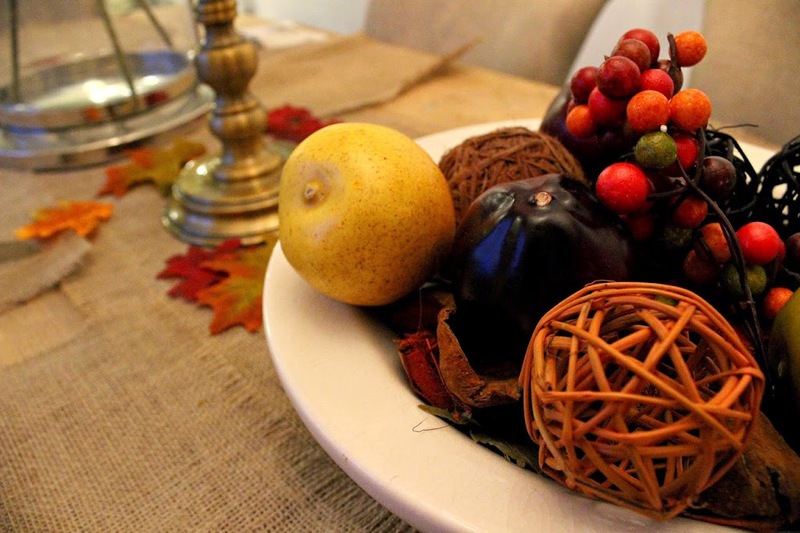 I paired this fake fruit with cinnamon potpourri to adorn the table. Looks stunning, I never think to decorate for Autumn but maybe I will this year! Love! Fall is my favorite season, so naturally I am swooning over your beautiful place. Keeping all of this in mind as we head back overseas soon! Loved your ideas and all the fall decor! I can’t wait to bust mine out! I’ll be referencing this in a few weeks! Love all of these ideas! Have the best weekend, xo! Beautiful! I love your home:) I want to see more pics!!! Your PSL is coming sooooon!! Have you heard the rumors? Oh, I just love what you’ve done! My husband thinks I’m crazy when I start decorating for fall, but it’s my soul season so… 🙂 And I love the idea of using colors that complement your palette already instead of the traditional fall colors. Great job! Your home is so beautiful!!! I can’t wait until it feels like fall out!